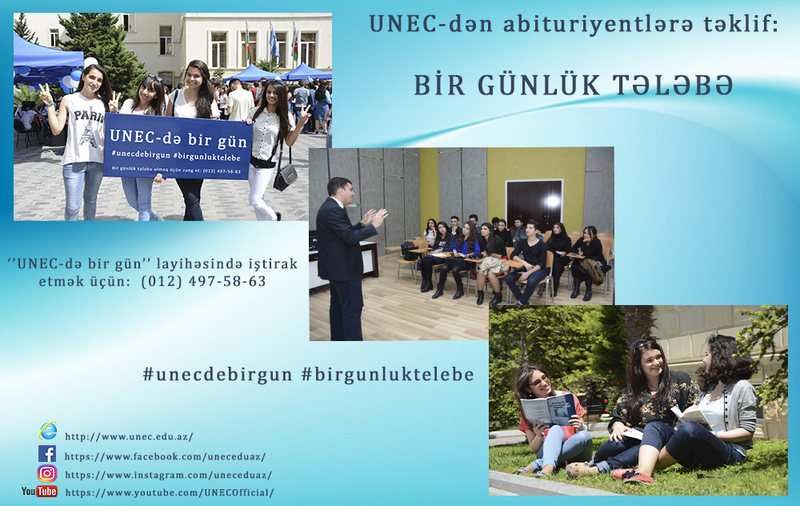 The UNEC creates the chance for senior grade pupils to become the “one-day student”. The goal of the “One-day at UNEC” project is to familiarize the pupils of the 10-11-th grades with the university more closely. At the same time, to provide the advice the pupils, having the difficulties in choice of the profession, and facilitate their participation at the lessons in the specialty disciplines as a listener. The lessons and the process of examinations at the UNEC , the largest eeconomy- oriented university in the South Caucasus , are open to the public. In the past academic year, the dozens of pupils who had benefited from this opportunity created for the applicants by UNEC are already the UNEC students. They say that, the participation at the lessons at UNEC in advance had played the major role in choosing the specialty. Along with the pupils, their parents can particiaped at the lessons, as well as. UNEC is the only university in Azerbaijan that provides the education in four languages (Azerbaijani, English, Russian and Turkish) and has a branch abroad. The taining on 21 specialties is carried out, here. UNEC is implementing the dual diploma program for bachelor’s degree level of education with the leader in training the economist specialists in Europe, the London University/London School of Economy and the Montpellier Universitety, one of the oldest universities in France. From this year, with the purpose of implementation the requirements arisen from the “State Strategy for the Development of Education in the Republic of Azerbaijan” the Internal University Dual Diploma Program has been launched at the UNEC. The Internal University Dual Diploma Program allows the bachelors to gain the decent place in the labor market and flexibly adapt to their requirements in the future by acquiring two specialties within 4 years. It should be noted that, the admission plan for UNEC in 2017/18 academic year was fulfilled with 96.6 percent. 288 out of 481 applicants who got 600 or higher score on the 2-nd specialty group, id est 60 percent, chose namely UNEC. Both applicants, Cavad Aliyev and Arzu Mammadzadeh, who had gained 700 points in the II-nd specialty group, are studying in the faculty of Finance in the International School of Economics at UNEC. 74 % of the applicants rewarding the Presidential scholarships in the II-nd specialty group are, namely, the UNEC students. Wishing to participate in the “One day at UNEC” project can call the land line number 497-58-63, or can contact the official Facebook page of UNEC.